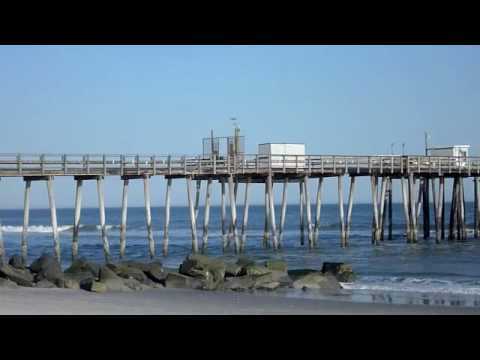 NJ Fishing piers are going the way of the drive-in theater. Their just aren't many around any more. It is unfortunate because piers tend to be an 'equalizer' in letting those without the financial means of owning a boat an opportunity to fish in the ocean. Unfortunately, Super Storm Sandy impacts dwindled an already short list to what we have today. 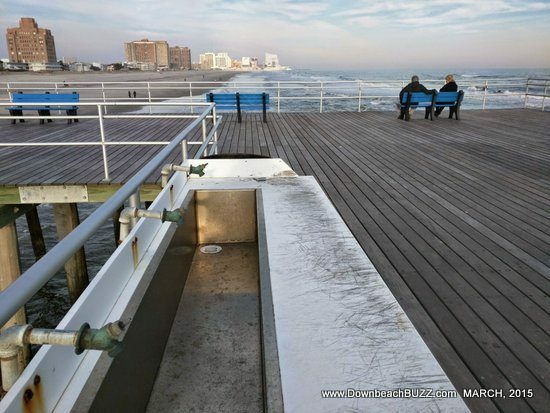 Pier is open for 2016. Must be a member of Angler's Club to use the pier. Angler's club cost $400 one time initiation fee and $425 per year which includes a locker. The Pier is approximately 2000 feet long. You have an amazing panoramic view of New York City, along with awesome sunrises and sunsets. Sweet Briar Rd. and Park Boulevard. With great views of the Barnegat Bay, this is sure to be one of the best fishing or crabbing spots in all of Ocean County. The Pier is 285‘ long x 24’ wide. We provide landing nets, a fish cleaning station, picnic area, and toilet facilities. 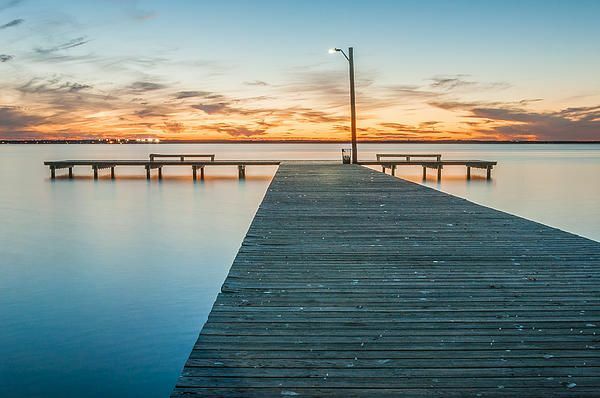 It is well-lit at night, family-friendly, and produces some of the finest catches of Flounder, Striper, Bluefish, Weakfish, Croakers, Kingfish and Blue Claw Crabs!!! Also the occasional Trigger Fish, Sheepshead, Drum Fish, & Almaco Jack. The Crabbing is Excellent! If you are new to Pier fishing, then there are a few things to keep in mind with regards to having the correct tackle. If you are on an Ocean or open bay fishing pier where Bluefish and Striped Bass are known to run, your not going to get by on light tackle. Still, you don't want anything too heavy to slow you down from casting and retrieving is in order. Additional length means better casting and leverage. You want a pole longer than you typically would use on a boat. Don't go too tall though because taller rods are also clunkier to operate so you really want to stay in 7.5 – 9 ft range with your pier fishing rod. This size rod will allow you to handle almost all types of fishing opportunities that will avail themselves while you are pier fishing. In addition to the possibility of big fish, the ocean is a challenge on your equipment as well. You need something that will handle dropping several ounces of lead as required on occasion. You do NOT want a light action rod for pier fishing. A rod with a MH (Medium-Heavy) designation is best to get started with. It just makes so much more sense to use a spinning rod for pier fishing. They are easier to cast and operate for experienced fishermen and newcomers alike. If you are looking specifically for a rod to fish on piers with, make it a spinning rod. It is worth noting that saltwater is really unforgiving. Whatever you can afford, buy the best spinning reel you can. If you take care of a good reel, it can last you for you years. However, some of the lower end models will last you 1 year and you will need to replace it. The quality of the rod is important also, but even the low end rods will last you a while, unlike the low end reels. Penn has been a well known name in saltwater fishing for decades. This combination is a great starter outfit for pier fishing and can also be used for surf fishing. And it won't break the bank. You can get this for less than $75. You should make sure you have a long handle or telescoping landing net when you are pier fishing. Most fish of any size will be lost as you try to land it on a pier if you don't net the fish. Telescoping nets make it easier to travel. No fisherman can go without fishing pliers. It pays to have a decent pair of pliers in your box for your pier fishing adventure. Remember, saltwater is unforgiving so make sure you get a pair of pliers made for saltwater use. Of course you will need to have a variety of hooks and swivels at your disposal. You can save some money over the course of a fishing season by buying hooks in bulk, but be careful because if they are not Stainless steel they will rust quickly just being exposed to salt air. So, either buy small packs of hooks and leave packs closed until ready to use or buy stainless steel hooks. In either case you will need a a variety of sizes. If you are a saltwater fisherman, you need Gulp. They make many varieties and most are quite qood. For pier fishing, 2 most haves are Curly tails and Shrimp. Nothing complicated here, just make sure you have 2 way, 3 way, and snap swivels in a few different sizes. Most pier fishing is done with a very simple set up of a 3 way swivel, a leadered hook with bait and a sinker. You will need an assortment of lead sinkers with most in the 2-5 oz range. You will save much money by buying in advance online as mark up on sinkers at piers and other tackle shops is high. You need bucktails, diamond jigs, and swimmers. Your set. Much like surf fisherman, many pier fisherman get coolers on wheels. This is another area where you want to buy the best you can afford. Cheap knives loose there edge quickly, rust and will not give you satisfactory value for your money over the long haul. Handles of something other than wood is preferable as wood never really comes clean and it acts as a germ hangout on your knife.